"One writes history as a historian and engages in political polemic as a citizen, and the one does not exclude the other. Yes, the two roles may sometimes overlap or become confused, but this need not be made into a big deal. It is less a theoretical problem than a practical one, which practical measures can sort out." E.P Thompson. Who else fits in this description of being an Historian as well as a citizen if not Prof M.S.S Pandian? He often juggled between being a historian and a political activist/commentator, and the two roles never seemed to be in contradiction. Rather there seemed to be a seamless flow of ideas from politics to academics and vice versa. ‘Radical politics’ for him was not always played on the streets, factories or in the fields; rather he had made his classrooms as an extension of real politics that took place outside. I remember, in the last semester of my Master’s degree (2009) we were supposed to write a seminar paper. I chose to write on the Insurgency in Kashmir. I approached three different professors from the Centre for Historical Studies, JNU and all of them gave one or the other reason as to why I should change my topic. Pandian was completely new to the campus, and I personally did not know him at that time. Somebody suggested that he is a ‘radical thinker’, who will be interested in guiding me. In fact Pandian was a ‘radical thinker’ and without asking too many questions, he calmed me down and suggested me to locate my sources required to write my seminar paper. One relationship which started that ended yesterday when I finally picked up his dead body and placed it in the ambulance. But relations beyond this physical body – relations of ideas, relations of respect, admiration and love – will be there always. It’s hard to write about Pandian (that’s what he liked me to call him) without bringing the personal angle into it. For many people, Pandian meant many things from being an original thinker to a great teacher; for me and for one of his favorite student Fayaz A. Dar, he was everything. Both of us called ourselves orphans yesterday and in fact, in this elite Brahmanical world of academia we have become orphans without Pandian. From writing recommendations, to editing my write-ups/MPhil chapters to discuss my personal and political engagements, Pandian was always there. He was always a call way, a visit away. Yes! People will read our chapters, send their comments, friends will discuss our personal problems and give suggestions and our comrades will always be there to clear our political confusions, but I doubt there will be people who will have the time and patience to sincerely engage with our nonsense like Pandian did, all the time – over and over again. In this world of empty rhetoric of equality and justice, nobody would dare to say in a class of 30-40 students that he will always have more time and love for those coming from the marginal sections of the society. This is what justice and equality meant for me. It was not abstract for him, but something very real which he always felt and cared about. Sir, margins and marginals will miss your interventions – both personal and political. It was this sense of justice and equality that made him to be critical of even his closest comrades and organizations. His remarks on the issue of Ambedkar cartoons in the NCERT textbooks were not liked by many, but as he said, “after all, what is often being perceived as ‘politically incorrect’ need not be ‘educationally inappropriate’.” This was one of the aspects of his politics, to provoke people – both in his classrooms and in their political lives. But he never criticized – like many contemporary academicians – for the sake of criticism or to demoralize you. Criticism was something meaningful for him, which always led the movements and individuals to grow from strength to strength. I remember one of our conversations at his flat where he took issue with my use of word ‘Kashmiri Nationalism’. Despite being an ardent supporter of Kashmiri Azaadi, he reminded me, ‘Amit, beware of this word Nationalism, it is like a double edged sword. It includes some and excludes others. Think beyond Nation and its boundaries – imagined and geographical’. Sir! I am trying to do that and earning a few more critics every day, like you did throughout your life. In the last two three years, Pandian had developed a keen interest in the history and politics of Kashmir. And this was one of the reasons why I and many other friends working on Kashmir History felt so close to Pandian. He gave us a platform to talk, discuss and debate Kashmir. When there is an upsurge of fascist powers in India and when bourgeois academicians are even worried to use the ‘K’ word, here was an academician who discussed Kashmir conflict threadbare in his classes. Not only that, for some time now he had been designing a course primarily on Kashmir and the Northeast. Despite the heated debates and discussions which all of us have had on Kashmir and Northeast, there is not a single academic institution (at least in India) where History of Kashmir and Northeast are taught as a separate course. This was something many of us were looking forward to. Sir! With you gone, not only have many of us lost a mentor, but Kashmiri movement has lost one of its ardent supporters who wanted to contribute his bit in his own way. Yesterday at AIIMS mortuary, where Prof Pandian’s body was kept, there was a huge gathering of his students, friends and colleagues. The students gathered were not only from the department where he taught, but students from JNU, DU, Jamia, Ambedkar University all were there. Teaching was not a ritual for him; it was a deeply political act, where the point was to make students question everything – even his own positions and ideas. I must confess I learned more from him over a cup of tea or while sharing a cigarette than the structured classes. For his students, he had dissolved the bridges between private and public life. He knew about our personal lives much more than our own friends and this gave him the clue how to teach and what to teach. 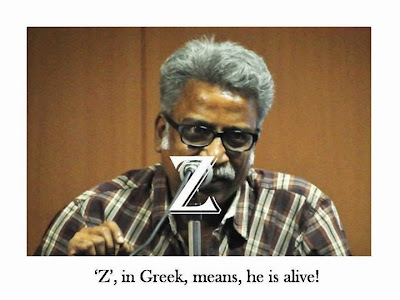 Recently, when Fayaz A. Dar joined Maulana Azad Urdu University as Assistant Professor, Prof Pandian wrote on his Facebook picture, “Brother, take teaching seriously. It is like Biblical wheat. The wheat has to die to sprout. One would have gone; then your students carry little traces of you -- if you are a good teacher. Being a good teacher is hard work.” Sir! Wheat you had sown has started sprouting and all of us carry some traces of you – in teaching, in research, in politics and in life. With moist eyes I say goodbye to you Mentor, Comrade, Friend, Sir!! !